Retired Lt. General William G. Boykin is seen in front of a flag. He has been criticized for anti-Muslim remarks. West Point issued a brief statement late Monday saying that retired Lt. Gen. William Boykin has decided to withdraw from speaking at the Feb. 8 prayer breakfast and another speaker would be lined up in his place. The Army is drawing protests from veterans’ and Islamic groups for inviting a retired general who many have called anti-Muslim to speak at a West Point prayer breakfast. 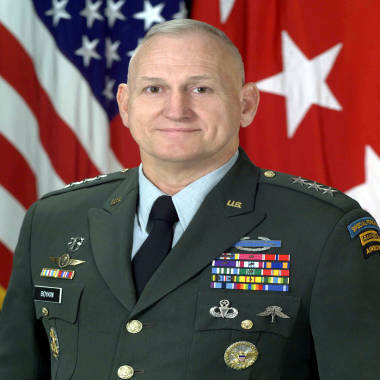 Lt. Gen William G. Boykin has been criticized for speeches at evangelical Christian churches in which he made disparaging remarks about Islam. Boykin has said that Muslims are trying to implement Shariah Law in the United States and that Islam is the greatest threat America faces. According to The Associated Press, Boykin has also said that America's enemy was Satan, that God had put President George W. Bush in the White House and that one Muslim Somali warlord was an idol-worshipper. Groups such as VoteVets.org, Military Religious Freedom Foundation, as well as Forum on Military Chaplaincy all petitioned the Pentagon to stop Boykin from speaking at the Feb. 8 breakfast, Stars and Stripes reported. VoteVets.org told Army Gen. Raymond Odierno in a letter that allowing retired Boykin to speak at the Feb. 3 National Prayer Breakfast Service would be contrary to Army values and disrespectful to Muslim cadets. "These remarks are incompatible with the Army values, and a person who is incompatible with Army values should not address the cadets of the United States Military Academy," VoteVets chairman Jon Soltz said in the letter, according to The Associated Press. Army public affairs didn't immediately comment, though West Point's Lt. Col. Sherri Reed said cadets are "purposefully exposed to different perspectives and cultures" during their four years at the academy. "The National Prayer Breakfast Service will be pluralistic with Christians, Jewish, and Muslim cadets participating," Reed said in a prepared statement. "We are comfortable and confident that what retired Lt. Gen. Boykin will share about prayer, soldier care and selfless service, will be in keeping with the broad range of ideas normally considered by our cadets." The Council on American-Islamic Relations is also asking officials to retract the invitation. Hooper calls the argument that Boykin represents an alternative viewpoint “ridiculous,” and equates it with inviting a racist white leader to speak at West Point since some of the cadets are African American. “I doubt that they would invite a KKK speaker and claim that they want to expose the students to a variety of opinions," CAIR’s national executive director, Nihad Awad, told the Associated Press, referring to the hate group the Ku Klux Klan. Just last week, CAIR and People for the American Way had asked officials in Maryland to rescind an invitation for Boykin to speak at a prayer breakfast. Boykin attended and spoke about his faith and did not mention Islam. Before his retirement in 2002, Boykin was chastised by military commanders for comparing the wars in Iraq and Afghanistan to a holy war. Boykin later issued a written statement apologizing and said he didn't mean to insult Islam. Pentagon investigation concluded that Boykin violated regulations by failing to make clear he was not speaking in an official capacity when he made nearly two dozen church speeches beginning in January 2002. It also found that Boykin, who made most speeches wearing his uniform, didn't get prior clearance for the remarks. Boykin couldn't immediately be reached by msnbc.com for comment. First Read: Romney eyes big finish in Fla.